The spirit of the Ancient Rus right on the border with the EU. Ivan Lermontov is 76 years old; he has a gnome-like white bushy beard and a thin walnut cane he always takes with him when he leaves his century-old house. He dashes outside every time someone approaches St. Anastasia Chapel located next to his gate. His tiny wooden cottage is the size of a minibus and crowned with a "toy" tin dome with a cross; it was built in the 19th century by the inhabitants of Brod village in the vicinity of Izborsk, one of Russia's oldest towns. "Our chapel stands on an old sacrificial stone," says Ivan as he taps his cane loudly against the foot-polished stone slab which shows from under the porch. "It was cut a thousand years ago, back in the pagan times, or even before that." Ivan watches the visitors' faces closely – a group of backpackers from Moscow, cameras at the ready. Not satisfied with the effect his words have had, he adds: "I've also seen a stone idol by the stream not far from here: it had been torn down and was lying on the ground, half-covered with turf; he had a body, eyes and a mouth – completely human-like!" Lermontov has dozens of similar stories in his memory, to prove that history in Izborsk is not a dull set of facts from textbooks, but tangible artifacts you can sometimes stumble across. The town is half an hour's drive from the European Union and 800 kilometers away from Moscow, at the border between Russia, Estonia and Latvia. Over a thousand years ago, a union of Slavic and Finnish tribes populating this area gave birth to the Russian nation. Today film directors come here to shoot signature Russian landscapes, and travelers visit the town to learn about traditions that can give them a better understanding of the world's biggest country. Izborsk is older than Moscow and most other Russian cities. It is mentioned for the first time in the Primary Chronicles, in the entry depicting how two Slavic tribes, the Krivichs and Slovenes, and the the Finno-Ugric tribes of Merya and Chudes grew tired of feudal wars and invited three Varangians "from overseas" in the year of 862, "to come and rule them." Having marked its 1150th anniversary, the present-day Izborsk looks more like a village formed by one-story wooden cottages scattered around a stone fortress. Its population is barely 1000 people. They believe that the name of their settlement was derived from the Russian word "izbranny" ("the chosen one"), and means "a place for the chosen." Scientists – archaeologists and landscape experts, who saw to it that Izborsk was turned into a federal museum preserve – tend to agree with them. Its churches and fortress have been assigned the status of national monuments. The celebrated Soviet film director Andrei Tarkovsky came here to shoot signature Russian landscapes. However, Izborsk has another unique feature which cannot be found in many museum towns: The customs and ways of the locals, "the chosen ones" who still view tourists as eccentrics who have come across their village by chance. Ivan Lermontov's house was built by his grandfather in 1913. Four years after they moved in, the Russian Empire collapsed. The near-border town of Izborsk – "the cradle of the Russian nation" – was left outside the borders of Soviet Russia, within the territory of the Republic of Estonia, which is why its residents have succeeded in preserving ancient ways that were eradicated by the Soviet authorities in many other regions of the country. The windows of Lermontov’s house overlook a hill the size of a 16-story building – Truvor's Hillfort. Its top is crowned with the church of St. Nicholas, built on the site of an ancient pagan shrine and resembling a lighthouse in its shining whiteness. The flat top of the hill was chosen as a location for a fortified settlement as early as in the 8th century, before the Christianization of Rus' – this settlement was the Izborsk mentioned in the chronicles. 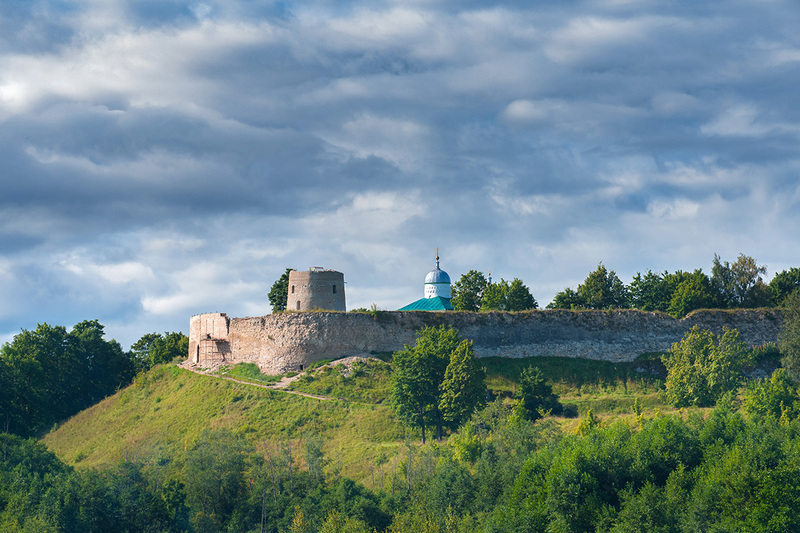 Most scholars presume it to be the first Russian fortress. "All my life is at St. Nicholas," says Ivan Lermontov, looking at the temple on the hill. "As a child, I would walk home from school past the church with a torch in my hand, and now I pass it on my way to the cathedral." On the morning of December 4, the Orthodox holiday of the Entrance of the Theotokos into the Temple, Ivan Lermontov walks three kilometers along the waterlogged dirt track before the sun is even up. He is carrying clean shoes to change into from his muddy boots before entering the temple. Leaving the swampy lowland behind, he takes a steep rocky path past Truvor's Forthill to the distant towers of the Izborsk fortress. It was erected in the 14th century by the rulers of Pskov, a Western Russian principality, for protection from the knights of the Livonian Order (its headquarters was located in the territory of modern Latvia and Estonia). The stronghold turned out to be unassailable: It survived dozens of sieges over the seven centuries of its history. Not once was the fortress of Izborsk taken by the enemy, which is why Europeans dubbed Izborsk "the Iron City". Above the defensive wall, the silvery dome of St. Nicholas Cathedral glistens in the sunlight – the main church of Izborsk and the destination of Ivan Lermontov's hike. Built in the same era as the fortress, the cathedral had been consecrated by 1349 at the latest and has not been closed since then. Considering that in the Soviet times, most Russian churches were turned into museums, at best, or vegetable warehouses and garages, at worst, St. Nicholas Cathedral is a rare example of a medieval church which has been truly preserved. At eight in the morning, there are already four dozen people at the cathedral. They are standing close to a gray-haired priest in a silver robe, who is half-reciting, half-singing in Church Slavic – few people understand it, but it still remains the primary language of Russian Orthodox worship services. Covered with a lace of frost, the windows are letting in bleak, cold light. The flames of thin church candles are crackling. The four dozen parishioners can see their breath in the cold. When the priest falls silent, the parish – women in motley kerchiefs and men in dark jackets, including Ivan Lermontov – cross themselves reverently, looking at the icon of St. Nicholas on one of the walls. The dome of the cathedral starts vibrating as sexton on the belfry swings the clapper of the largest alarm bell, the one that used to warn the townsfolk of an approaching enemy. And now it signals the continuing pulse of life in this ancient town.